Complex 4 is a low carbohydrate protein shake which is high in protein to aid the development of lean mass, muscle growth and repair. Complex 4 is an optimum blend of de-lactosed pure whey protein concentrate, pure whey protein isolate , hydrolysed whey protein and Branch chain amino acids (BCAAs). It contains fast and slow release protein giving the body a double dose of protein. This is supplied through an instant supply of whey protein followed by a dose of egg albumen and casein around 2-4 hours after consumption. Whey isolate is the purest form of protein available and hydrolysed whey is protein offering high levels of peptides and amino acids. Peptides maximise absorption as our body can absorb peptides much faster than whole proteins. 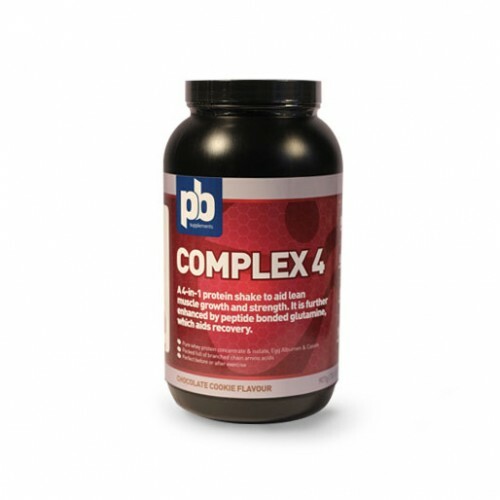 Complex 4 is further enhanced by peptide bonded glutamine, which helps with recovery. It also contains digestive enzymes and pro-biotics to enhance the protein digestion and help to maintain a healthy gut. Therefore, Complex 4 is an extremely advanced protein shake and we believe it is one of the best available in the supplement market today. Most studies have shown that supplementation of whey protein can enhance muscle growth in response to resistance training. Some studies also suggest that whey may enhance recovery from heavy exercise and possibly decrease muscle damage and soreness (Sundell et al., 2011). This product is manufactured on equipment which processes products containing nuts & gluten. Therefore, we cannot guarantee that it is nut or gluten free. Mix 1 x 30g scoop with 300ml Water or Skimmed Milk. For best texture mix with a PB Shaker. For best training results take 2 shakes a day, one with breakfast & one between meals or after training.